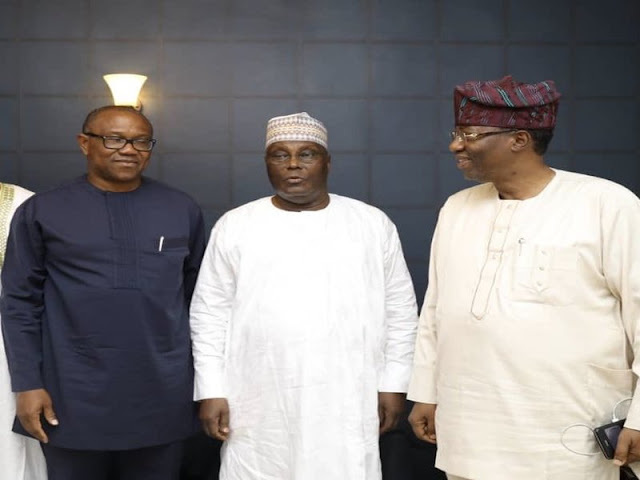 Since Atiku Abubakar emerged as the presidential hopeful of the defunct and corrupt Peoples Democratic Party, the cyber space has been greeted with unwarranted fanfare and sycophantic praise singing. Even some media vuvuzelas took it upon themselves to gossip from pillar to post with the central aim of convincing some weak minded homo sapiens that can hardly differentiate between light and darkness. For those who will call for my head after reading this piece, I am not in anyway attempting to scuttle the plans of those political wolves who are making every concerted effort to maintain the status quo in Nigeria but I am only magnanimously penning down this expository piece just to remind those Atikulated zombies that they are gravely sending down the final nail into their coffins. I have spent quality time for the past one week studying various reactions of people from different quarters over the emergence of Atiku Abubakar who is slated to iron it out with Buhari in the usual fraudulent election that will be taking place in 2019. Notable individuals whom I even expected to approach this development with utmost caution were the ones who jumped into this sinking ship without considering where it is invariably navigating to. The exact thing that happened in 2015 is gradually rearing up its ugly head again. After much thought for the past one week, I am here to inform those Atikulated apologists that neither Buhari is the problem of Nigeria or Atiku Abubakar by any means can be the answer to the myriad of problems that is sapping this devilish lugardian edifice to death. Atiku Abubakar will further aggravate the pains of Nigerians. The solution to the staggering problems plaguing Nigeria can only be solved by Nigerians if they are willingly bold to take the bull by the horn. Anybody who is myopically believing that Atiku Abubakar is a prayer answered must be stupendously stupid. 90% of those people that call themselves Nigerians are suffering from low intelligent quotient and lose of memory. They lack the ability to dissect information properly. And there is this disease of forgetting serious issues that usually compounds their misery so easily. Nigerians have been molded to see whatsoever nonsense that goes on in the country to be normal. And finding a workable solution to these problems, to them is a very stupid thing to do. Therefore, it becomes expedient for all and sundry to keep mute and live like lifeless zombies. For those who do not know, Atiku Abubakar is one of the staunch corrupt buddies that mercilessly looted the national coffers very dry for personal aggrandizement. As the vice president between 1999 to 2007, he was made the chairman of Bureau of Public Enterprise. This is a government agency that was mandated to sell off some government owned properties to private actors that have the wherewithal to manage them. Atiku Abubakar who had another notorious bandit on board the ship called El-rufai connived together and came through a proxy to bid and took over some of these properties with looted funds without consideration for due process. This was among some of the problems that created a rancorous relationship between him and the con master named Olusegun Obasanjo. We are also aware of how Atiku Abubakar as a former custom controller aided the diversion of dozens of briefcase loaded with millions of U.S dollars to an unknown destination. Till date, nobody called Atiku Abubakar to answer for such atrocious act. I can go on and on to unmask the political bad market named Atiku Abubakar. I am still in awe how Atiku suddenly became spotless. Nigerians are dead woods. For those gullible zombies who naively think Atiku Abubakar is the answer to the problem of Nigeria just scored a terrible own goal. If I may ask these Atikulated apologists whose brains have refused to reboot, will the so called saint Atiku Abubakar operate beyond the confines of the fraud called 1999 constitution? Or he will come on board with a different constitutional document? Will he bring an end to Fulani terror? Budget padding? Jumbo allowance for indolent lawmakers? Marginalisation? Religious and ethnic bigotry? And the 419 called federal character principle? Atiku Abubakar will never and can never be an answer to these myriads of brouhaha rather he is a part of it. As a Biafra activist and volunteer journalist, I am not interested over who becomes the president of the devils abode called Nigeria. I am only using this veritable opportunity to remind those weak minded Biafrans who are lost over the recent Atikulated frenzy to thread with caution or they will forever live to hibernate in regrets. We must not raise any form of eye brow despite their wooing gimmicks. Atikulated bandwagons can even go to the grave of former Biafra patriot and leader, Dim Odimegwu Ojukwu, exhume his body and make him the vice of Atiku, we won't shift our ground. They can also release our supreme leader from their dungeon and make him the vice of Atiku, we will massively boycott 2019 election. Enough is enough! We shall end this madness come 2019. Exactly what we need to teach our people. They forget easily. Shared at https://blackjunction.com/Biafra_IPOB to avoid the Facebook censoring as well.